After skin cancer, prostate cancer is the most common cancer in men, usually affecting those over 50. Researchers in Cambridge have led on MR imaging to better identify tumours within the prostate, coupled with precision biopsy techniques using fusion software. 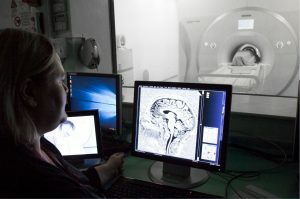 Clinicians at Cambridge University Hospitals have been working with imaging researchers to carry out Magnetic Resonance Imaging (MRI) targeted prostate biopsies (needles into the prostate to retrieve samples), using MRI-Ultrasound image fusion software. In 2011, Cambridge was the first centre in the UK to use this technique routinely in the clinical setting, for repeat biopsy in high-risk patients. This practice was subsequently adopted in the 2014 update of the NICE guidelines for prostate cancer. Cambridge researchers developed the Ginsburg group guidelines on how to perform targeted ‘transperineal biopsy’ to allow standardisation of the technique. The traditional diagnostic pathway of prostate cancer has been changed since 2015; prior to intervention, men now have the MR imaging before undergoing a biopsy. This pathway has provided clinicians an improved way to identify cancerous tumours in the prostate and has reduced the number of invasive samples being taken and in some cases avoiding a biopsy altogether. This has allowed clinicians to “get it right first time” and is helping men to be diagnosed faster and start treatment earlier. The Anglian Network Cancer Group has adopted this practice as its Prostate Best Practice Pathway, and NICE have suggested that this practice will form part of their updated 2018 guidelines for prostate cancer diagnosis and management.